Guidelines for miking a symphony orchestra utilizing A-B set-up. 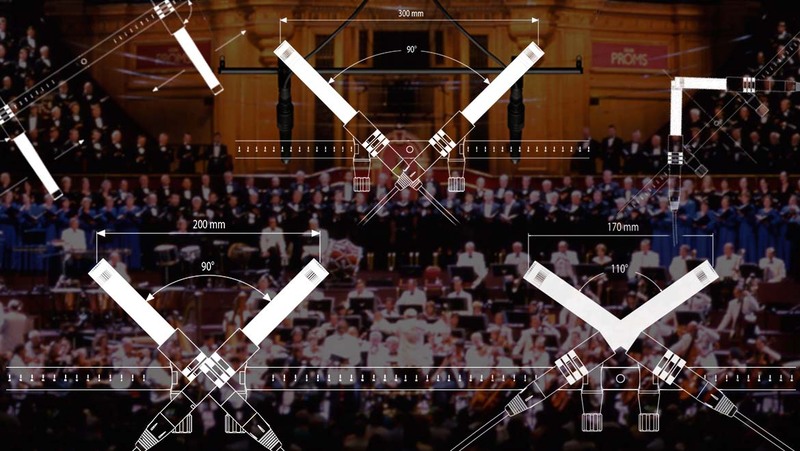 Keywords: Classical orchestra, A-B microphone set-up. The overall aim when recording large orchestras using just a main stereo pair is to faithfully reproduce the instruments, the tonal balance of the orchestra, the directivity of instrument sections and the concert hall in which the orchestra is to be recorded. This juggling act requires more than a few compromises and the art is in reducing these compromises to a minimum. If you are not familiar with the A-B Stereo techniques, it is recommended that you read the A-B Stereo section on here. The position of the main stereo pair will also be the perspective of the future listener; therefore the sound engineer's goal is to create the illusion of natural perspective in placing the main stereo pair. In doing so, there is not necessarily any correlation between the actual placement of the microphones and the best seats in the hall, and consequently, placing the stereo pair correctly takes much effort. The distance to the orchestra and the height of the microphones above floor level should be adjusted for equal coverage of the different orchestra sections and for the amount of ambience required in the recording. Usually the optimum position is above or right behind the conductor's podium at a height of between three and four meters, so that no musicians obscure the instrument behind them. A good rule of thumb is: if you can see the sound source you can also hear it. When using d:dicate™ 4006A Omnidirectional Microphones in large orchestral setups, the distance from the sound sources to the main stereo pair normally requires the use of the DD0297 Diffuse-field Grids. These grids give the microphones a linear diffuse-field response and help compensate for the air absorption losses of higher frequencies due to the distance. In rare setups the orchestra is arranged around the conductor in a semi circle. In these situations it is important that the main stereo pair isn't placed too close to the centre of the semi circle as the instruments around the edges will be recorded too far off axis, creating a heavy coloration (comb-filter) of sound due to the direct time delay occurring between the microphones. Channel separation in the A-B Stereo technique is determined by the distance between the microphones. Compromises have to be made so that the orchestra sounds natural with a proper stereo width. Normally the spacing is adjusted between 40 and 60 cm. Some producers favour greater spacings of between 1 and 2.5 meters and sometimes more, but in these cases a hole will start to appear in the middle of the stereo image. This can only be compensated by using a third microphone placed between the two others. DPA's UA0837 Stereo Boom allow the use of two microphones separated by distances of between 15 and 60 cm. Experience will show that the optimum microphone spacing is dependent on both the size of the orchestra and the reverberation time of the concert hall. When increasing the number of instruments in the orchestra, the microphones need to be spaced further apart to give the listener the optimum stereo image. The microphone spacing should also be increased to improve channel separation in more reverberant rooms. The stereo image is checked in the control room, where individual sections of the orchestra can be fine-tuned by adjusting the angle of the microphones. The spatial qualities of these microphones can be used to brighten up the sections or to give them lower priority in the recording. For example, by aiming the microphones at the back wall just over the orchestra, it is possible to brighten up the sound reflection from the wall and thereby add a convincing depth to the recording. More ambience can be added to the recording without losing the fine position of the main stereo pair by fitting the UA0777 Nose Cone onto the microphones. This makes it possible to capture the full spectrum of the reflected sound from the walls in the concert hall, as the Nose Cones turns the microphones into perfect omnidirectionals across the whole frequency range. The use of A-B Stereo techniques without support microphones can create an extremely convincing depth in the stereo image and capture a realistic room impression. The sound sources, ie musical instruments and room reflections, are picked up with the correct time alignment relative to the placement of the main stereo pair, which explains why this method is often regarded as the purist's choice.